Each day your staff interacts with customers, coworkers, and supervisors. Each of these interactions is a potential source of stress. And when that stress mounts it can cause long-term damage to their health and well-being, and have a negative impact on the productivity of your department. 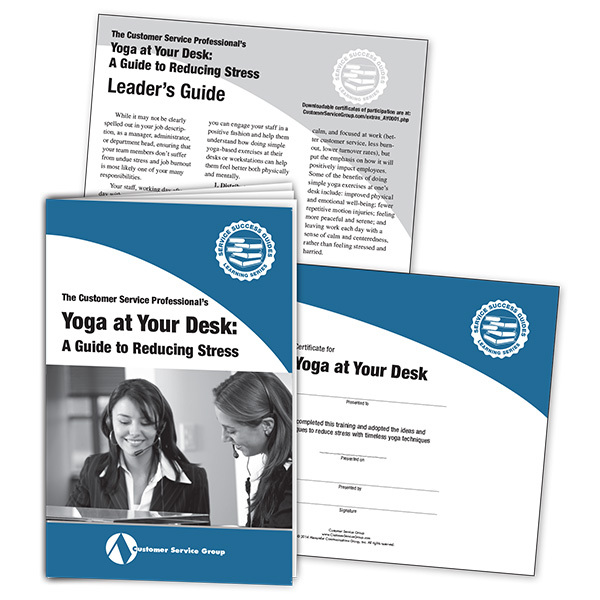 Now you can give your reps the tools they need to reduce stress with timeless yoga techniques adapted to the modern office. 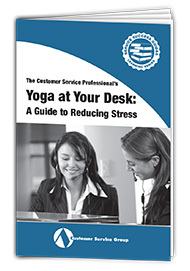 Yoga instructor and author Michaeline Kiss has created Yoga at Your Desk: A Guide to Reducing Stress especially for customer service reps. In it she presents 23 exercises that can be done in just one to two minutes each either sitting at a desk or standing. Increase their focus and attention. 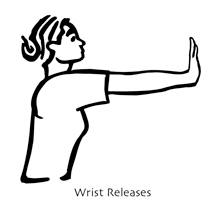 These simple movements take a minute or less each and improve circulation and release tension in the shoulders, neck, jaw, eyes, wrists, and hands. These techniques can be used throughout the day — especially during long periods working with a keyboard and monitor. One of the core yoga techniques, the breathing exercises will show reps how to use their own calming breath to reduce stress. These exercises relax the muscles and release tension in the problem areas of the shoulders, neck, and lower back. They can be done seated or standing in less than two minutes each. These simple exercises help take attention away from stressful situations and provide a quick, on-the-spot break from the workplace. The refreshers should be used at the beginning of your yoga routine and at any point throughout the day when you feel tension building. You may practice the entire set or focus on one area such as your neck, shoulders, or eyes. These simple movements can be done sitting or standing and take a minute or less each. These exercises are especially important for those using the keyboard for long periods of time. 12. Wrist Releases. Raise your left forearm until it is parallel with the floor, while keeping the elbow close to your ribcage. Raise your fingertips to the ceiling. Push forward with the heel of your palm until you arm is fully outstretched. (You will look like you are trying to stop traffic.) Now, angle your fingers back toward your shoulder to increase the stretch. Hold for three seconds. Release. Slowly release your arm at your side. Repeat with the right arm, then one more time with each arm. Shake out your wrists. 13. Finger Releases Part I. Hold your hands wherever they are comfortable, stretch your fingers as far apart as you can, close them in a fist, then stretch them wide again. Repeat twice more. 14. Finger Releases Part II. Stretch both arms forward and begin to “climb” an imaginary ladder in the air, grasping the rungs and moving hand over hand. Follow the movement of your hands with your eyes as you reach for the highest rung possible. Relax your arms at your sides and shake out your wrists. While other stress management techniques can take you away from the immediate source of stress — whether it’s customer phone calls, or coworkers, or onsite customers — they don’t necessarily get the stressful situation out of your mind. While you are walking around, you might still be occupied by something that happened on the phone or in the office. With yoga, part of every practice is the focus and concentration that go along with it. So when you are doing the yoga postures or exercises, whether it’s neck and shoulder rolls, eye relaxers, or simple breathing exercises, you are doing them with focus and concentration, allowing you to detach yourself from the situation that might have been causing you stress. With concentration, you are continually bringing your mind back from other distractions to focus on the exercise. That concentration and focus on what you are doing is the major difference between yoga and other techniques for stress management. You might be tempted to get your team together to practice these yoga postures and exercises as a group, whether as part of a training session or on an extracurricular basis. But, in general, yoga isn’t really a group sport. The minute you make it a group practice, there’s the temptation to become competitive, and some people might become self-conscious and not participate. 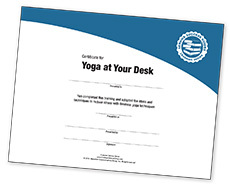 The beauty of many yoga exercises is that they can be done individually and right at one’s desk. By practicing on their own, your staff is always working at their own tempo, at their own pace, and they are doing just what they can do in the time they have available. Also, by keeping it at the individual workstation, the practice is integrated into the work day in the most natural way. 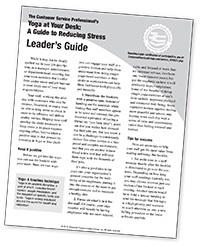 This also encourages individuals to recognize when their level of stress requires attention, and it allows each person to control when and how they deal with their own stress levels. Yoga at Your Desk is guaranteed. We want you and your reps to use this valuable resource and put its ideas to work in your department. Then, if you are not 100% satisfied, you may return your materials within 30 days for a full refund.